This quinoa cake is going to knock your socks off! Let me start by saying that chocolate cake with chocolate frosting is James’s very favorite food. It’s his penultimate. He orders it whenever it appears on a menu or when we visit bakeries. 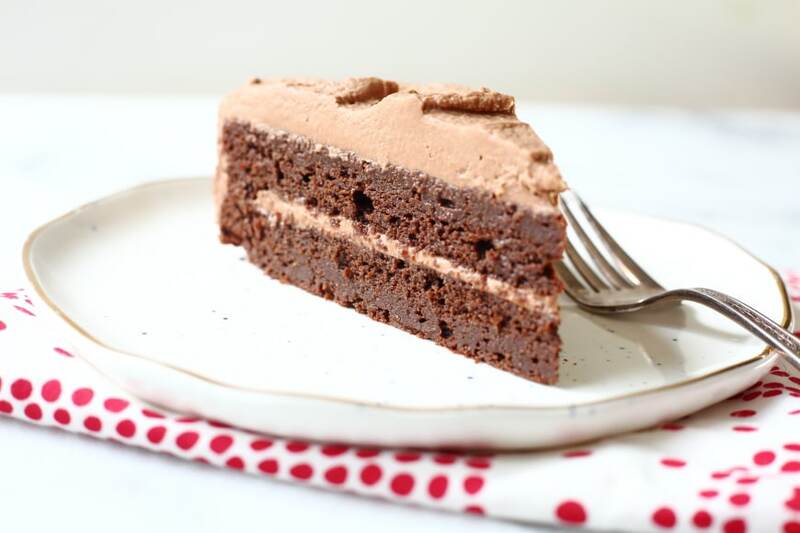 Now would you believe me if I told you that this chocolate quinoa cake, which contains NOT A SPECK OF FLOUR and is STUFFED WITH QUINOA is James’s FAVORITE CHOCOLATE CAKE IN THE WORLD? You need to taste it to believe it. Unlike James, I’m somewhat ambivalent about cake (as described here, I’m a pie gal). However, I do love making rustic, one or two-bowl cakes that are homey but soul satisfying (like this and this). What I don’t like are the overly sweet, multi-layered elaborations that are often dry in the middle with a saccharine frosting (or, god forbid, fondant). I don’t like eating them, and I don’t like making them. So for years poor James went with chocolate cake fake-outs on his birthday. Chocolate soufflés! Chocolate lava cakes! 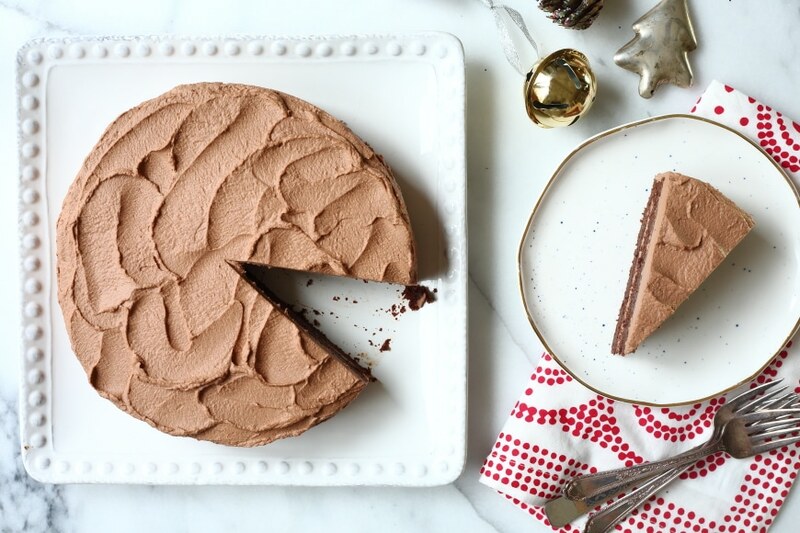 Chocolate cream pie! He devoured them them all, but I could tell that they weren’t quite the “chocolate birthday cake” of his fantasies. 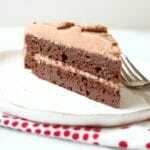 That is, until a few years ago, when I stumbled upon a few chocolate quinoa cake recipes while perusing the web. The recipes promised that nobody would ever suspect that there was quinoa in the cake, and that the result was an ultra tender cake that everybody loved. I was roped in because they seemed insanely easy to make and looked just like the cakes I’m geared towards—rustic, supremely moist and chocolaty. I surprised James on his birthday with the cake, not telling him that instead of using flour, the cake is bound with cooked quinoa instead. He had no idea and instantly fell in love. It’s now the cake he asks for every year, and I’m more than happy to oblige! I’ve played around with various recipes to develop this version, which is somehow both rich yet light. You won’t believe how easy it is to make—the batter AND the whipped cream frosting get whizzed up right in the Vitamix (meaning no mixing bowls)! 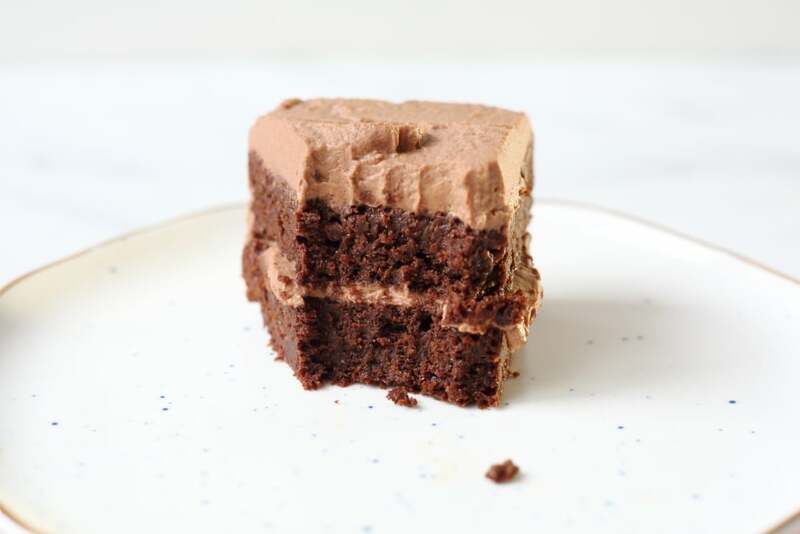 This cake just happens to be filled with nutritious superfoods, but you wouldn’t know it—quinoa provides a superbly rich crumb, raw cacao powder gives the cake an unparalleled rich chocolate flavor, and virgin coconut oil lends moisture. The frosting is my new favorite frosting, period. It’s adapted from the chocolate frosting that I developed for my crepe cake in my free Holiday Baking with Bob’s Red Mill Craftsy class. This version is even easier—heavy cream, powdered sugar, raw cacao powder, vanilla and coffee liqueur (which is optional, but highly recommended) are simply blended in the Vitamix until thick enough to spread. I’ll be lathering this frosting on all my cupcakes from here on out, as well as dolloping it over ice cream and hot chocolate. With the holidays at our doorstep, this chocolate quinoa cake would be the perfect finale to a special occasion meal. 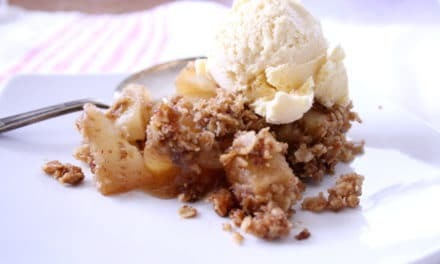 However, it’s also easy enough to whip up on a whim—I can’t imagine a more delicious way to inject some serious mid-week cheer into the season. I’m sending my heartfelt, warmest wishes to you and your family this holiday season. May you be safe and healthy, and may you always have room for cake. Vitamix Blade Scraper: While this blade scraper isn’t essential, it’s my favorite new tool for scraping away every last ounce of batter/nut butter/sauce/etc from under my Vitamix blade. It would make for a fun stocking stuffer for all you Vitamix fans! Raw Cacao Powder: Raw cacao powder is the purest form of chocolate you can eat and is much less processed than cocoa powder. 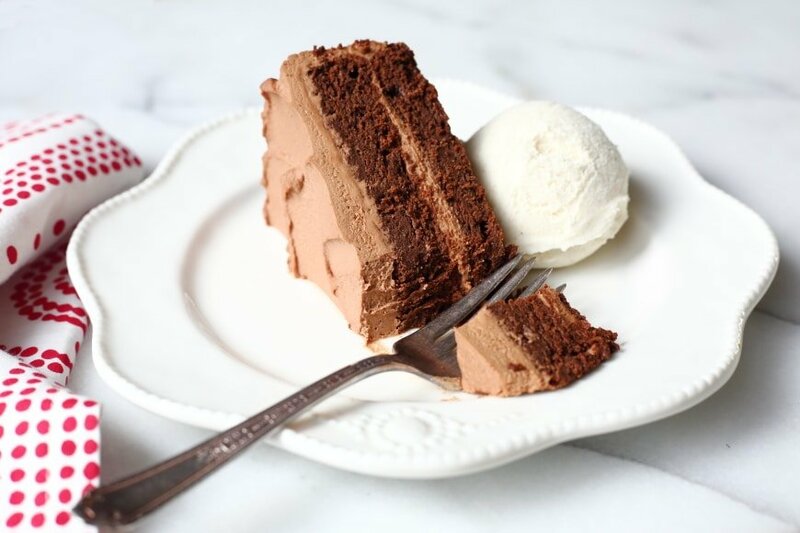 It lends an unparalleled rich chocolaty flavor to the cake. It’s also extremely high in antioxidants (try it in this hot cocoa!). Quinoa: You can use any plain white or golden quinoa. Avoid red or black quinoa, as the flavor is too assertive. *Thank you to Vitamix for sponsoring this post! I was compensated for this post, but all opinions and recipes are my own and are not endorsed by Vitamix. 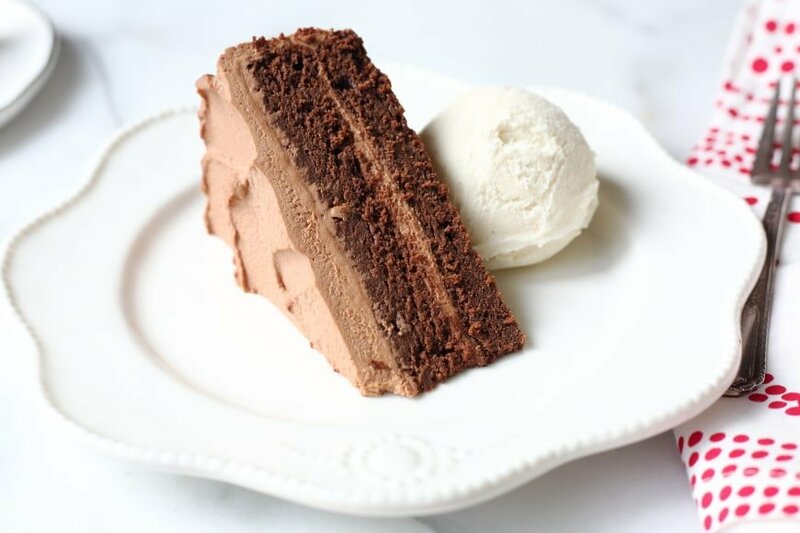 This is my VERY FAVORITE chocolate cake to make and eat, and you would never know that it doesn’t contain a speck of flour AND that it’s made entirely in the Vitamix or blender (meaning no mixing bowls)! The cake is made with cooked quinoa, which provides a wonderfully moist texture, but you can’t taste it AT ALL. 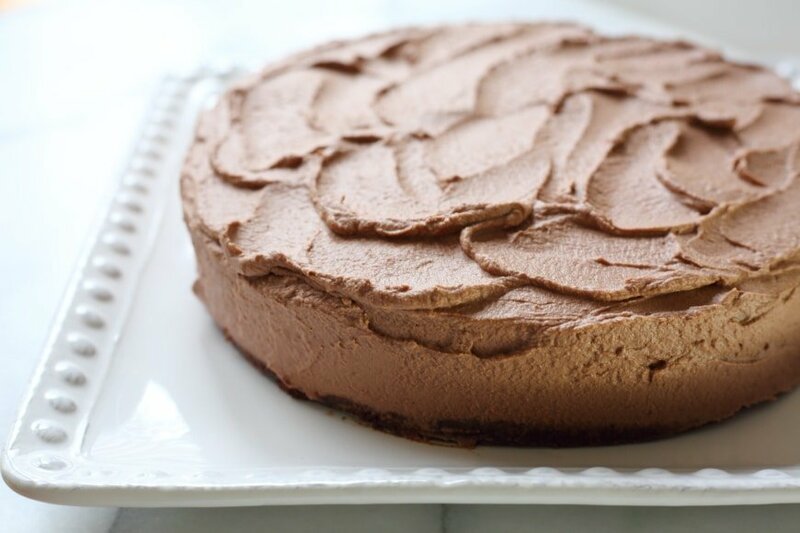 Raw cacao powder lends an unparalleled deep chocolate flavor—don’t swap in regular cocoa powder as the cake won’t be as rich in flavor (see sources above). 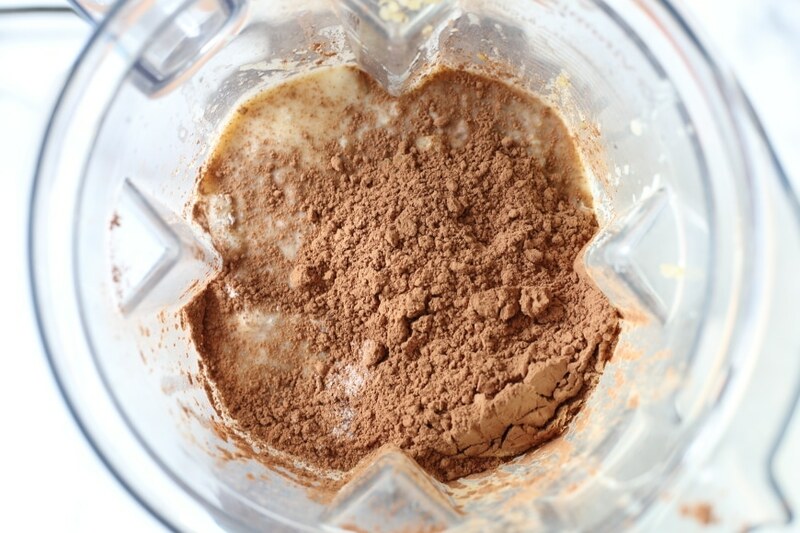 The light and creamy chocolate whipped cream frosting also gets made right in the Vitamix. This is the ultimate birthday, holiday or special occasion cake, but it’s easy enough for everyday. The recipe was adapted from www.MelsKitchenCafe.com. For the cake, preheat the oven to 350˚F. Lightly grease two 8-inch cake pans and line the bottoms with parchment paper. In a Vitamix or blender, combine the milk, eggs, vanilla, coffee liqueur and coconut oil. Blend until incorporated. Add the quinoa, sugar, cacao powder, baking powder, baking soda and salt. Blend, increasing the speed to high, until smooth, stopping and scraping occasionally. Divide the batter between the prepared pans and spread in an even layer. Bake 20-23 minutes, or until the cake springs back when lightly pressed and a toothpick inserted in the center comes out mostly clean with a few crumbles (don’t over-bake otherwise the cake will be dry). Let the cakes cool in the pans set on a wire rack for 10 minutes. Invert the cakes onto racks, and peel off the parchment. Let cool completely before frosting. For the cocoa whipped cream frosting, place all of the ingredients in a clean Vitamix (if you don't have a Vitamix, you can make the frosting in a bowl using a stand mixer or electric mixers instead). Blend on low until fully incorporated. Slowly increase the speed, blending until the mixture is thickened (it will no longer move around the blade in the Vitamix). 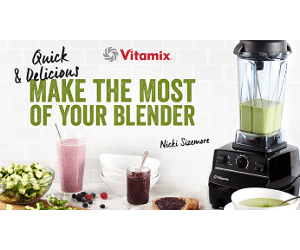 If using the Vitamix, stir with the tamper while the machine is running until the cream is stiff—it will only take a few more seconds (if using a bowl and mixers, simply continue beating until stiff). 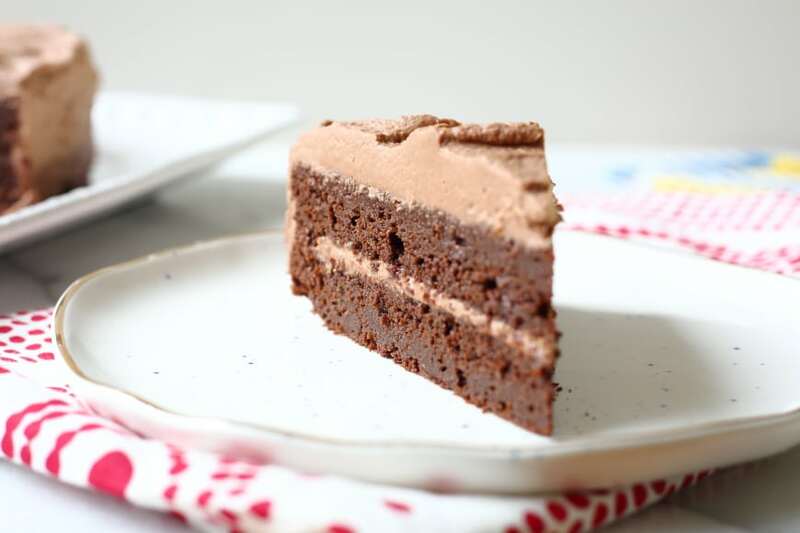 To frost the cake, very carefully slide one of the cake layers onto a cake stand or serving platter (the cake is very tender and has a tendency to break if it’s handled too much, so go slowly! That being said, if it does break, simply patch it back together on the cake plate—nobody will know!). Spoon about a quarter of the frosting on top, and spread it in an even layer. Place the second cake layer over top, and spoon on the remaining frosting. Spread the frosting in an even layer on top and around the sides of the cake. If possible, cover the cake with a dome or large bowl and refrigerate it for at least 1 hour before serving. You’ll need to start with ¾ cup of dry quinoa to yield at least 2 cups of cooked quinoa (be sure to use golden quinoa, not red or black quinoa, which will be too assertive in flavor). Rinse the quinoa well, then place it in a small saucepan with 1 ½ cups of water and a pinch of salt. Bring the water to a boil, then reduce the heat to a simmer. Cover and cook 15 minutes, or until the water is absorbed. Remove the pot from the heat and let sit 10 minutes, covered, to steam. Fluff the quinoa with a fork, then transfer it to a bowl and let it cool completely. Once cool, measure out 2 cups of cooked quinoa for the cake (you will have leftover quinoa, which you can toss is salads or use in grain bowls). Once cooled, the cakes (without the frosting) can be wrapped well and stored at room temperature for up to 1 day (take care when moving the cakes, as they are very tender and can break fairly easily—I find it easiest to slide them onto plastic wrap instead of picking them up). Before frosting the cake, I like to slide narrow strips of parchment paper under the edges of the cake so that I don't get my serving platter dirty (see the video for reference!). The cake can be refrigerated for up to 6 hours before serving. Leftovers (if you have any!) are also delicious the next day. 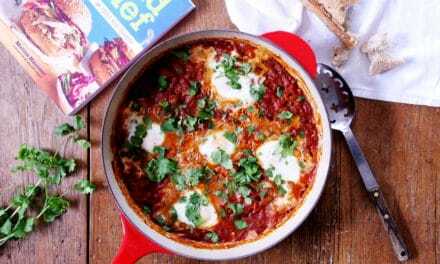 PreviousDIY Vegetable Frittata & NEW Craftsy Class! 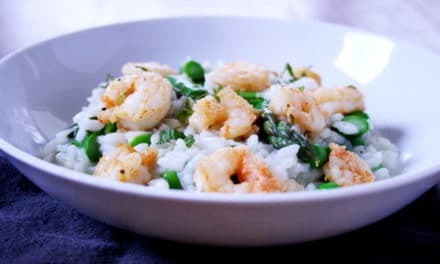 Amazing recipe ! Everybody loved it. I’m so thrilled you liked it, Marie!